Now we are back home and slowly settling down. 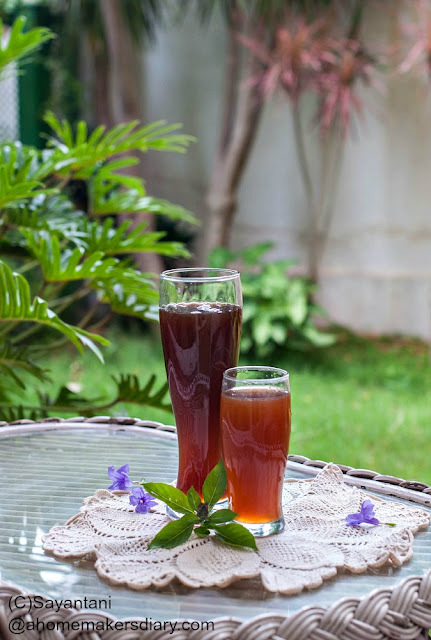 The weather is much better now with the monsoon cloud hovering on us but the humidity is still bad we are glugging glasses after glasses of all sorts of lemonade to keep ourselves hydrated. This jaggery lemonade is something I drank at an organic food restaurant last year. The flavour was good but the balance was little off. 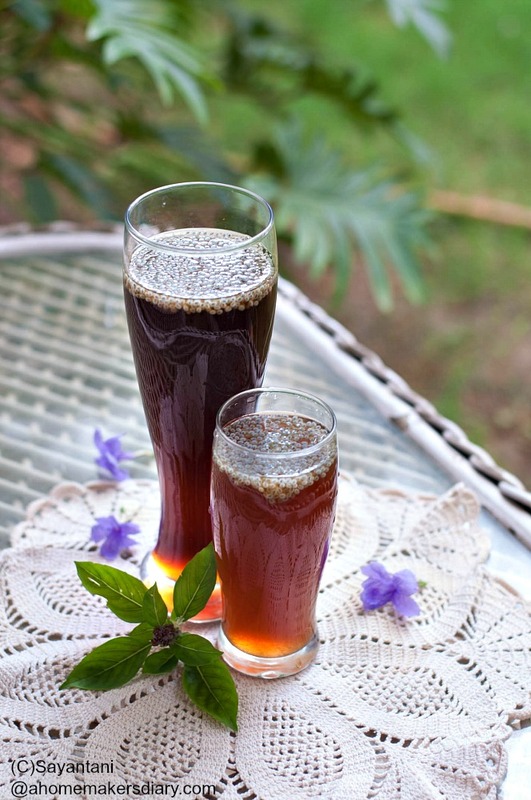 I experimented with the recipe and now this one is one of our most loved and absolute go to drink. 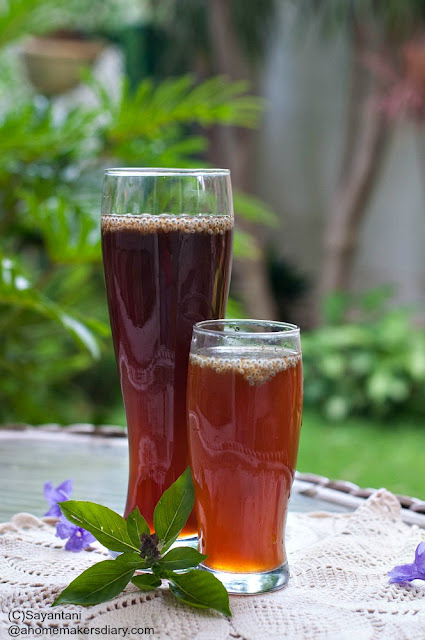 If am still not able to allure you to this drink then you must know that Jaggery/gur is the closest substitute of refined sugar but because it is unrefined and has the molasses content it is much healthier than white sugar. It has iron, magnesium, potassium, Manganese and some amount of B vitamin, zinc and phosphorus. Somehow my kids took to its taste and now a days I always make Lemonade like this. I make the syrup every week and store it in fridge for anytime lemonade craving. The syrup is always spiked with little fresh ginger that complements it's earthy flavour very well. and always serve with a spoonful of soaked sabza or basil seeds. Kids love that crunch. Peel and grate the ginger and place in a deep, heavy bottom saucepan. Add 3 cups of water and the grated jaggery. Bring it to a boil. Then on low flame let it cook till the jaggery melts. If there is any impurity from the jaggery comes as white scum on top carefully remove it with a slotted spoon. Boil for 5-6 minutes till the syrup thickens a bit. Mix the salt, Cool and strain. Keep this in a bottle and store in fridge. Soak the basil seeds in 1/2 cup of water for 5 minutes till they swell. Add 1/2 cup of this syrup in a medium size glass and squeeze half a lemon. mix and top with chilled water and ice. Taste and if needed add more lemon or syrup. Mix in 1 tbsp of basil seeds and serve immediately. I liked this drink! My go to drink is always lemonade - sometimes I add ginger and mint. But this one is truly refreshing and yes jaggery is any day better than sugar. A simple and comforting drink..will definitely try out.